Tom Petty, the story goes, was inspired to become a musician after meeting Elvis Presley. So it's only fitting that Petty, with his band The Heartbreakers, would bring a touch of The King to The Gorge Saturday for a sold-out, season-opening show. For all his mellow, laid-back persona, it's clear that Petty, after a quarter-century in the business, knows how to be a Rock Star. And, what's more, he really digs it. Petty ambled onstage in faded jeans, an untucked white oxford and a blue blazer encrusted with glistening jewels that would've made Elvis proud. A striped scarf tied once around his neck fluttered in the wind. 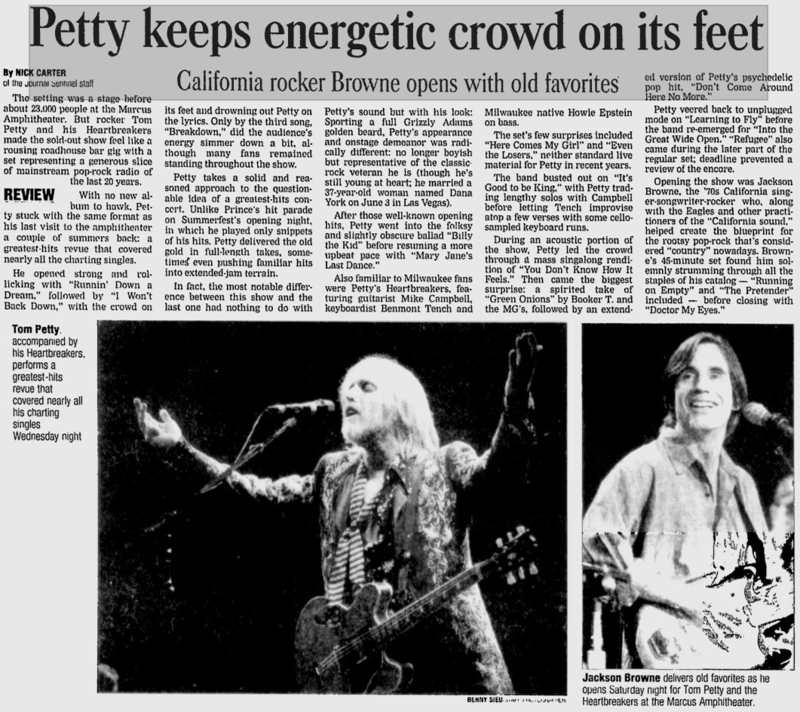 With an exaggerated strum of his guitar, Petty kicked off the 90-minute performance with 1989's "Runnin' Down a Dream." The song was the first of many -- some reaching far back into The Heartbreakers' library -- to showcase the band's strong backing abilities. Celebrating 25 years of playing a hybrid of British and American classic rock is quite a feat for Tom Petty & the Heartbreakers. It does, however, present a problem in concert. How does the band choose a set list that's representative of all its blues-rooted, rock-projected, Grammy-winning songs about how the little guy matters? How does it pick songs explaining the bond between some Gainesville, Fla., country boys who started in the no-name band Mudcrutch and came to define American rock 'n' roll? Put simply: It doesn't. It can't. Not in an already generous two-hour set anyway. After releasing Anthology: Through the Years, the two-disc retrospective of radio hits, late last year it was expected that Friday's show at the Woodlands Pavilion would follow suit. The 18-song set did feature career-spanning hits, from debut single Breakdown to '90s highlight Mary Jane's Last Dance. It was the non-Anthology, more obscure offerings, however, that allowed Petty and his backing Heartbreakers to demonstrate their musical symbiosis. Extended jams on a cover of Howlin' Wolf's Red Rooster and a smackdown saloon romp Billy the Kid allowed a crowd of close to 17,000, for a brief moment, to sit in with the group during its most casual moment and to see where the chemistry begins. The setting was a stage before about 23,000 people at the Marcus Amphitheater. But rocker Tom Petty and his Heartbreakers made the sold-out show feel like a rousing roadhouse bar gig with a set representing a generous slice of mainstream pop-rock radio of the last 20 years. 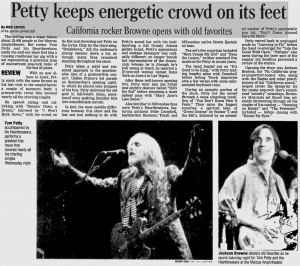 With no new album to hawk, Petty stuck with the same format as his last visit to the amphitheater a couple of summers back: a greatest-hits revue that covered nearly all the charting singles. He opened strong and rollicking with "Runnin' Down a Dream," followed by "I Won't Back Down," with the crowd on its feet and drowning out Petty on the lyrics. Only by the third song, "Breakdown," did the audience's energy simmer down a bit, although many fans remained standing throughout the show. SARATOGA SPRINGS -- Tom Petty may look like an old geezer these days. But he's sure not playing like one. A silver-bearded Petty and his Heartbreakers played the Saratoga Performing Arts Center Saturday night, cranking out hit after hit for more than 18,000 who jammed the amphitheater and lawn. It was one of the nicer double-headers of the SPAC season. Jackson Browne opened the pleasant, breezy evening with an hour of his own big songs. But it was really Petty's night. The man who once represented the new wave of pop in the late 1970s and his Heartbreakers played everything fans expected, opening with "Runnin' Down a Dream" and following with "I Won't Back Down" and "Breakdown." 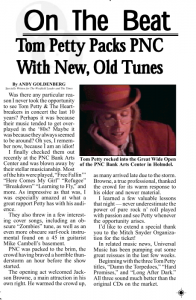 Quite possibly the most consistently inspired American hit machine to rock 'n' roll the radio these past few decades, Tom Petty arrived at the Post-Gazette Pavilion last night two years down the road from "Echo," the Heartbreaker's latest collection. And while the crowd of 18,606 was treated to an organ-soaked "Billy the Kid," Petty wasn't promoting an album so much as a lifestyle. He and the boys in the band approached the show like rock 'n' roll students, disciples and cheerleaders, taking a break from their own amazing catalog to honor a few of the songs that made them what they are today, from Booker T's "Green Onions" to a gritty take on Howlin' Wolf's "Little Red Rooster" and on to an encore of "Rainy Day Women #12 & 35" by Petty's most obvious hero, Bob Dylan. Editor's Note: Although GoneGator.com is now defunct, you can now find it at TomPetty.rocks. Tom Petty gets a cyberspace home here: Tom Petty and the Heartbreakers, in town this weekend for a gig, have a few gigabytes dedicated to them as well, courtesy of an Atlanta fan. Tom Petty and the Heartbreakers' gig at HiFi Buys Amphitheatre on Saturday puts the longtime rocker on a little bit of home turf, at least in cyberspace. Atlanta is the home of an unofficial Web site dedicated to Tom Petty (right) and his band. The site, www.gonegator.com, is operated by Sean Bresnan, a 34-year-old Web designer and longtime Petty fan. He drew the site's name from Petty's record and publishing label. The site, in its present state, has been up for about a year, and Bresnan says 5,000 to 6,000 individual users stop by in an average week, with a weekly hit count ranging from 75,000 to 90,000. Was there any particular reason I never took the opportunity to see Tom Petty & The Heartbreakers in concert the last 10 years? Perhaps it was because their music tended to get overplayed in the '80s? Maybe it was because they always seemed to be around? Oh yes, I remember now, because I am an idiot! I finally checked them out recently at the PNC Bank Arts Center and was blown away by their stellar musicianship. Most of the hits were played, "Free Fallin'" "Here Comes My Girl" "Refugee" "Breakdown" "Learning to Fly," and more. As impressive as that was, I was especially amazed at what a great rapport Petty has with his audience.